I am always looking for products that are good for my hair most leave me wanting something better. 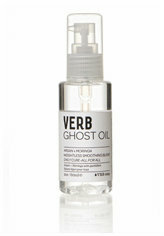 Well I have found something brilliant, Verb hair care. My thoughts: Ghost Oil is Awesome I always have frizzy fly aways on top of my head and the curls underneath my hair so just a drop of this miracle oil solved my problems no more fly ways!! Also I tried this while straightening my hair and my hair looked better than ever! Verb Leave-In Mist is the essential step between washing and styling and is a must have for kids with truly unruly hair. This Formula was created it: moisturize, detangle, nourish, smooth, tame frizz, repair ends, add shine, prevent breakage, enhance elasticity, protect from heat, prep for styling. My Thoughts: The Leave in Mist is great for both adults and children! I myself have curly hair that is pretty tangle-y at times so I sprayed this in my towel dried hair and woke up the next morning with shinier softer more manageable hair! And My daughter has WAY thick hair, I cursed her with it i guess, but she will not let us cut it not even to thin it out, she wants to be Rapunzel and have long long hair, which I've explained layers and thinning still keeps it long, but She thinks she'll lose her magic if she cuts it, Thank you Disney, anyways back to thick unmanageable hair, it's out of control she wakes up every morning with awful knots and it's a battle to brush her hair, After using the Leave in Mist Her hair was tangle free in the morning; I just sprayed some in her hair after bath time and she woke up with "princess hair" as she called it! This body boosting mist amplifies fine hair for a full flexible finish. Verb Volume Spray is a weightless formula designed to pump up any style while leaving the hair with an all-day soft and touchable hold. My Thoughts: The Volume Spray was My Favorite! I'm always trying to get Volume to stay in the crown of my head and with back combing and other "root lifters" it never failed to fall within 5 minutes of styling my hair! Well With This Volume Spray I just simply Sprayed it into my damp hair, kinda worked it in the spots I really wanted the lift, and went to sleep. (Now you can use this however you style your hair wash then blow dry or lazy like me and sleep on it wet) I will admit I was skeptical of this product actually working but when I woke up the next morning I was blown away I had just the right amount of Volume in the Places I sprayed with no back combing!!! The first day I used this product I sprayed my hair with Hair spray like normal, but the second day I skipped out on the hair spray and the Volume still lasted all day!! This product should be in every girls beauty supplies!!! 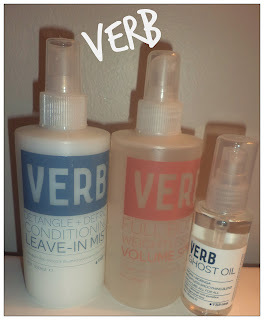 Overall I am completely sold on Verb Products! They are inexpensive and honestly really work! 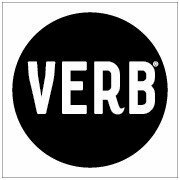 Want to Learn more about Verb Go HERE! 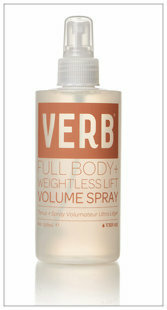 VERB Has offered one of you Lucky Readers a Chance to Win your very own Volume Spray byVerb just follow the Rafflecopter form below!! Hi, Neat post. There's an issue together with your site in web explorer, may check this? IE nonetheless is the market leader and a huge component to people will omit your fantastic writing because of this problem. previous to and you're simply too wonderful. I actually like what you have received right here, certainly like what you are saying and the way in which you say it. You are making it entertaining and you still take care of to keep it smart. I cant wait to read far more from you. That is really a wonderful website. Hello to all, it's truly a good for me to pay a quick visit this website, it contains valuable Information. website is in fact good and the users are actually sharing nice thoughts. be pay a quick visit this site and be up to date all the time. This has madе me think if theгe's a few places I could do things more efficiently. Not many wig retailers in the UK offer handmade hair extensions. Abhair.com, an online retailer offering a rich array of Virgin Indian Hair Extensions recently added clip in hair extensions to its existing range of products. The company now offers handcrafted hair extensions that are processed from natural human hair. The 100% remy hair wigs that the company offers now has become an instant favorite among the loyal customers of the UK wigs retailer. As these extensions are not cut from hair wfts, Kissyhair can now reassure their customers about the quality and durability of these hair extensions.